Inside The Birthplace at Lowell General Hospital, where more than 2,300 babies are born each year, there is a common theme, according to Kari Hoddeson, Clinical Manager of the Labor and Delivery Unit. Every day, she says, there is a focus on family. When Lowell General Hospital had the opportunity to create a new labor and delivery unit as part of the Legacy Project to build the new Dahod Building, which opened in 2012, the goal was to provide the best possible care for mother and child, while considering many of the smaller things facing families in these life-changing moments. Features of this state-of-the-art unit include some of the latest advances in maternity care, including spacious early labor rooms, a soothing whirlpool tub or laboring moms, a modern infant security system and two surgical suites for Cesarean section deliveries. But for Matt and Stephanie Dineen, who gave birth to a healthy daughter named Paige on September 3, it was the staff’s attention to detail that stood out most. “They took care of the little details and allowed me to focus on my wife and newborn child,” Matt says. “Lowell General Hospital went the extra mile in every way,” Matt says. 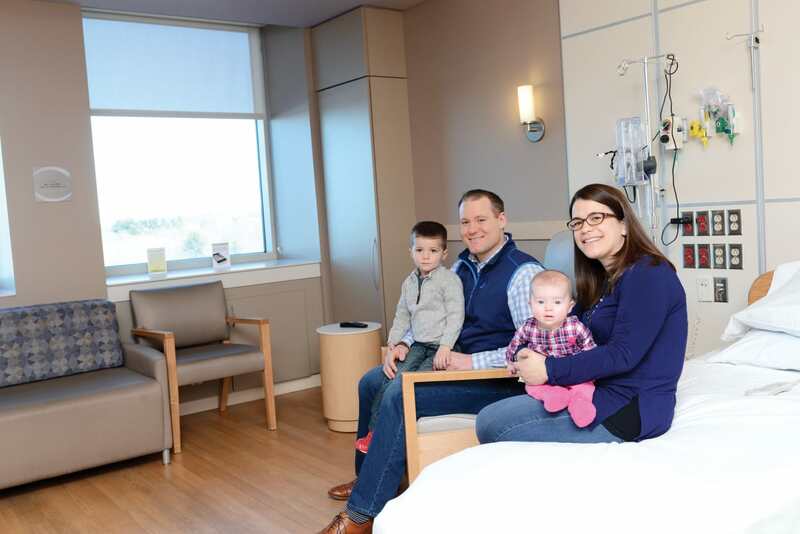 The Dineens had their first son, Brett, at another hospital three years ago, but chose Lowell General to have their second child after a job change and move to Chelmsford. The care was great at both hospitals, Matt says; the difference was how Lowell General focused on their whole family. The Dineens say staff went out of their way to make sure 3-year-old Brett, the new big brother, didn’t feel left out. But one of the biggest differences was way the staff took care of dad. Along with additional sleeping accommodations, The Birthplace has modern, spacious Labor and Delivery rooms to make room for family and visitors, along with separate flat screen televisions for the mother and guests, and a large bathroom that is easy to navigate. Matt also praised the caring staff, who followed through on Lowell General Hospital’s mission to put Patients First In Everything We Do.